Finding the best remote control monster truck toys can be a difficult job. There are hundreds of choices available that all have slightly different specs – it can be incredibly confusing if you don’t know what to look out for. That’s why we’ve researched what the top monster trucks have to offer. We have put them into a guide format for you to easily read to make the most informed decision on the best one. To make the process even easier, there’s a general buyer guide section towards the end for your reading! 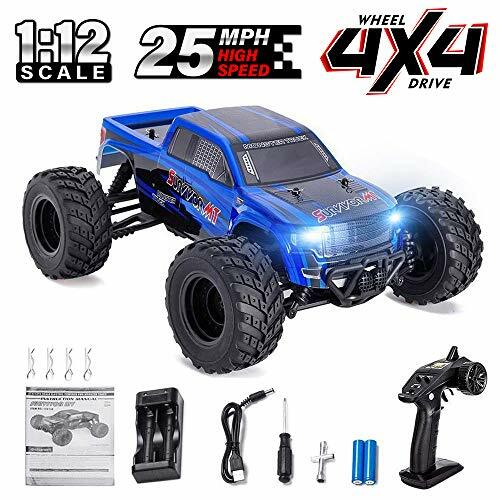 This monster truck remote control car comes with a fantastic 4-wheel drive feature, as well as a motor at the rear and front. This provides you with plenty of control when it comes to navigating through different kinds of terrain. The steering is incredibly responsive which makes it easier for kids to control. You can also control the truck from up to 260 feet away. We liked how the design looks realistic as it makes the experience more fun for kids. Parents have appreciated how the battery can be easily recharged to avoid spending extra on batteries. The 4-wheel drive feature enables kids to use this toy on all kinds of terrain with a lot of smoothness. In additionthe responsive steering, they can be sure to have a blast! This FitMaker car can be used indoors and outdoors. So, you can use it on tiles and carpets, as well as grass and roads. 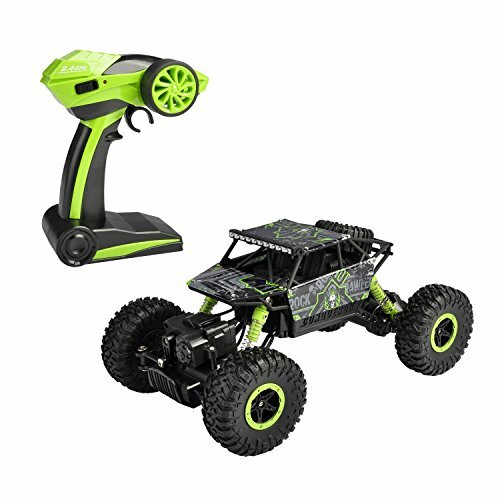 The materials used include high-grade ABS plastics which make the remote control car incredibly durable and strong. We were impressed with how the motor has an overheating protection feature. It ensures the motor can perform at its best for a long time. 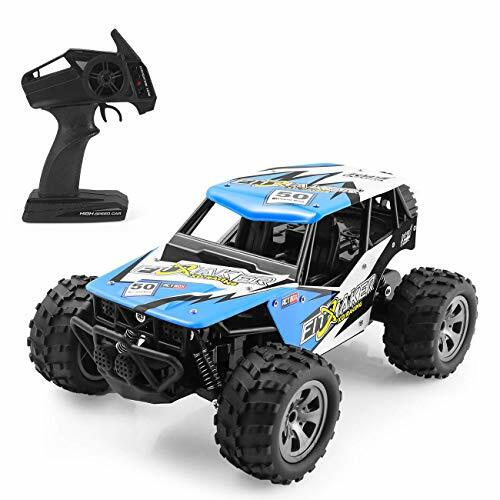 This RC car is fast and can reach a top speed of 20 km/h, which is plenty for kids to have fun with. You can control the car using the remote while being a distance of up to 100 meters away. Users have been liking how the remote has a pistol grip as it makes controlling the directions and speed of the car feel more natural. The batteries can also be recharged easily by using a USB cable. It takes around 2-3 hours to fully charge. The pistol grip on the remote control makes this super easy to control. Kids love taking it to the top speed of 20 km/h while being in full control. 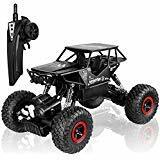 Blexy’s RC Off-Road Rock Climber has a 4-wheel drive feature which makes going across tricky terrain feel a lot easier. It’s able to go across regular hard surfaces, as well as sand, grass, and rocky roads. The 4-wheel feature also comes with independent suspension springs which makes the truck effective at dealing with big bumps and shocks. This also protects the electricals on the inside from damage. We liked how they’ve used elasticated, soft, and high-quality PVC materials to make the tires. This makes them resistant to skidding on wet surfaces. You can also control the truck while being up to 80 meters away from it. Kids have been loving how it can get up to speeds of 20km/h. Since the 4-wheel drive feature comes with independent suspension systems, you can be sure that the electricals on the inside will be protected, regardless of how rocky the terrain is. 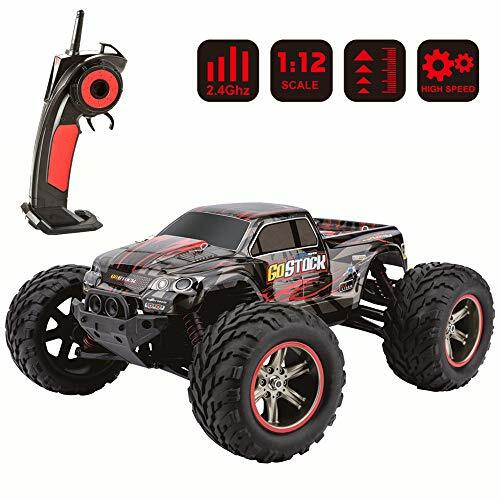 Hosim’s RC truck comes with two powerful motors which enable you to reach impressive speeds of up to 46 km/h! In order to keep up with this speed, the tires have been designed with a strong grip and a lot of tread. We liked how you can use this truck both on and off-road as a result of the tires. They prevent any skidding too. The 4-wheel drive system includes springy materials which ensure maximum support for the truck. So, in the case of any sudden bumps and falls, the truck will remain sturdy. The 4-wheel drive also makes it easier to control in all directions. We were impressed with how this truck can reach speeds of up to 46 km/h. The strong tires make this possible, while also ensuring that the truck doesn’t skid when off-roading. The Toydaloo Off-Road Monster Crawler comes with a 4-wheel drive system. In addition to this, there are tires that have an anti-skid design to ensure that you can use it on a wide range of surfaces easily. It can be used indoors or outdoors, which means it can handle going across mud, grass, gravel, carpets, and tiles. With an independent suspension spring system combined with the 4-wheel drive, the body of this truck is incredibly strong and able to withstand a lot of shock. This makes it very durable against rocky terrain and protects the electrical system inside. The rubber tires have been made using PVC materials which provide the truck with plenty of grip across wet surfaces. 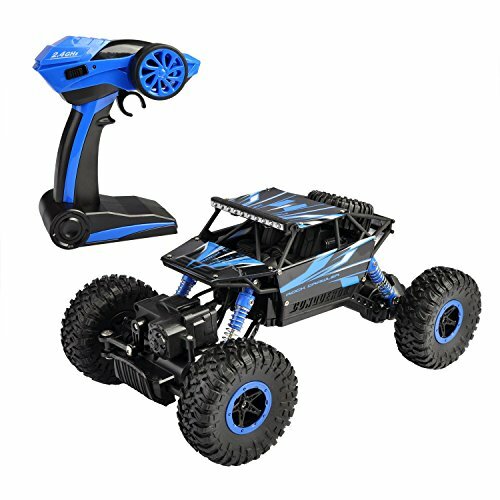 This is a remarkably durable RC truck that can handle going across all kinds of terrain. You can be sure that this one will last your child for a while, regardless of how many bumps it takes! 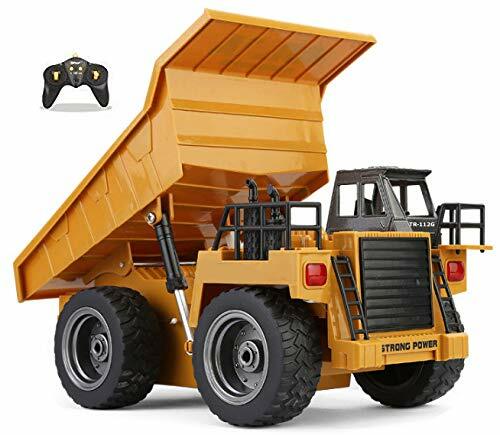 This toy dump truck comes with some fantastic sound and light features. As a result, it’s incredibly stimulating for children’s visual and hearing senses. You have complete control over the truck by using the remote and being able to move it forwards and backward, as well as left and right. Moreover, the control can be used while you stand a maximum of 100 feet away from the truck. Parents have been liking how the battery has a rechargeable feature as it prevents the need from having to buy more batteries. Kids have been loving how this toy comes with light and sound features. It makes the truck feel more fun and interactive to play with. 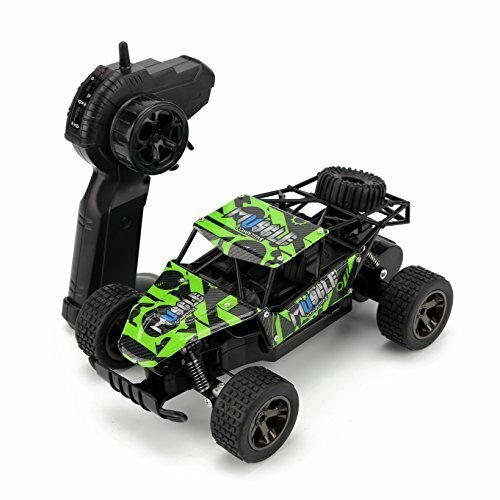 Hapinic’s RC Car has been made with high-quality plastic materials that are free from harmful components. Therefore, you can be sure that it’s completely safe for your kids to play with. The battery can last for up to 30 minutes after it’s been fully charged. This is impressive for a battery powered car, especially when you consider the charging time. This car only takes around one hour to fully charge! They’ve used 2.4GHZ radio technology for the control which makes the signal strength and responsiveness incredibly strong. You’re able to reach top speeds of up to 15 km/h, which is plenty for kids who are 6 years and over. You can also use this car across sand, grass, and regular ground. We liked how this it can be used continuously for up to half an hour when it’s on a full charge. Moreover, recharging the battery only takes an hour! 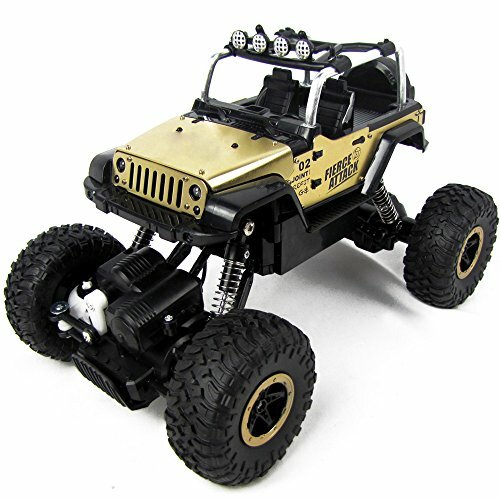 The SZJJX Off-Road Vehicle Crawler Truck has been made using remarkably strong PVC materials. This ensures that no matter how many bumps and falls it takes, it will be protected to last you for a long time ahead. With four independent suspension springs, you’re able to use this truck across a range of different surfaces with ease. Moreover, they’ve used high-quality PVC rubber materials to make the tires. This makes them incredibly strong, not to mention, they’re also elastic which gives the truck more flexibility across tricky surfaces. Furthermore, they have an anti-skid feature to prevent slippages on wet roads. Kids love being able to take this to its maximum speed of 25 km/h. Even at this top speed, the responsive remote control gives you complete control over the truck while being up to 50 meters away. The strong materials and design of the wheels make this truck a great choice if you’re looking for something to take off road! FitMaker’s All Terrain Truck can be used both indoors and outdoors. Therefore, it’s great for tiles and carpet, as well as grass and muddy terrain. Parents have been appreciating how the tires don’t leave any marks when used indoors! They’ve implemented S-truck suspension tech which provides you with more precise control. It also ensures that the truck can handle bumpy terrain better and keep the internal electricals protected. So, you’re able to use this truck over rough terrain for a long time to come. We liked how the 380 motor comes with an overheating protection feature too. This prevents the motor from becoming too hot and creating problems. The S-truck suspension makes this it very easy to control when going over bumpy surfaces. It also keeps the electrical protected from damage for better durability. 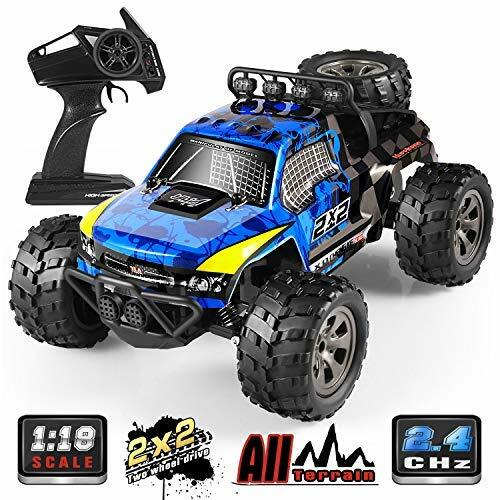 AHAHOO’s RC Off-Road Truck comes with a 4-wheel drive function which makes it incredibly effective for indoor and outdoor use. We were especially impressed with how the truck can climb up to 45-degrees while going up an incline. Kids love testing the truck to see what kinds of slopes it can climb! A powerful motor has been fitted which provides you with a top speed of 25 km/h. This motor also has an overheat protection function to ensure it remains durable. The tires have been made using PVC materials which makes them strong and able to withstand rocky terrain. You can be standing up to 60 meters away while using the remote to control the truck. Furthermore, you can get a maximum of 25 minutes of continuous play after it’s been fully charged. The charging time takes around 3 hours and you don’t have to worry about replacing batteries. The fact that this truck can climb steep inclines of up to 45-degrees is impressive. Your kids will have a blast seeing how this truck powers its way up some large slopes! 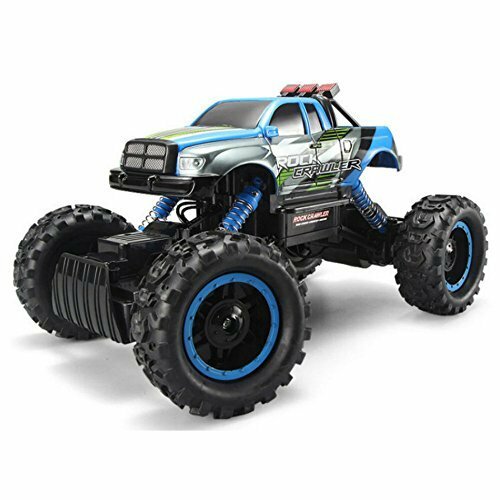 This Monster Truck is a great option if you’re looking to use it indoors and outdoors. It works well on tiles and carpet, as well as mud and grass. It has been fitted with S-truck technology which means it has an improved ability to perform well when off-roading. The 380 motors that’s been used has been combined with an overheat protection system that prevents the motor from getting too hot. This helps to make the truck more durable. The 2.4G transmitter means that you have an incredible amount of responsive control while using the remote. We liked how the remote has a 4ch steering system for more accuracy over your driving too. Users have been liking how responsive the remote control is and how the truck can be used both indoors and outdoors. The S-truck tech makes it especially great for the outdoors. 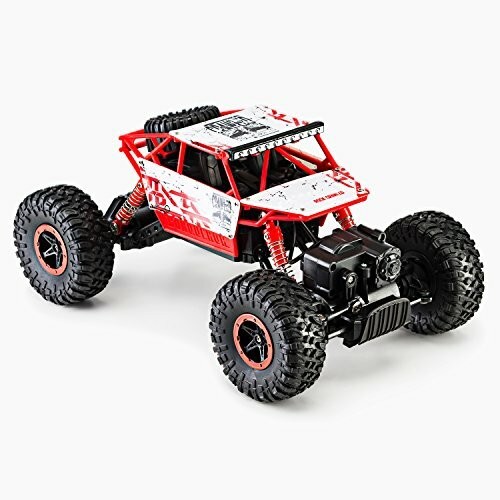 This off-road RC Monster Truck has been designed with a fantastic anti-collision mechanism. This means that it can withstand a lot of wear and tear without breaking easily. With a 4-wheel drive feature and large anti-skid tires, you can feel confident in taking this truck out in harsher weather conditions and still be able to have a blast. They’ve included high suspension shocks which work effectively to minimize any damage from bumpy terrain. You can be standing up to 350 feet away from the RC truck and still have complete control over it. The control enables you to move the truck in all directions for more freedom and fun. If you’re looking for something that can resist being damaged from some rough tumbles outdoors, this one may be perfect for your needs. The 4-wheel drive and anti-skid tires also make it a joy to play with. The Go Stock truck has been fitted with an incredibly powerful 390 motor. This enables you to take the truck to high speeds of up to 42km/h! We were impressed with how it has an IPX5 waterproof rating as it makes it resistant to being damaged from rain. This also gives you more freedom to use it on wet surfaces without worrying about causing any damage. The tires are large in size and have been made using rubber materials. This makes them resistant to shock from any bumps and prevents any skidding on wet terrain. You’re able to use the remote to control the truck while standing up to 260 feet away from it. As long as you’re within this range, you have total control over how you move the truck. 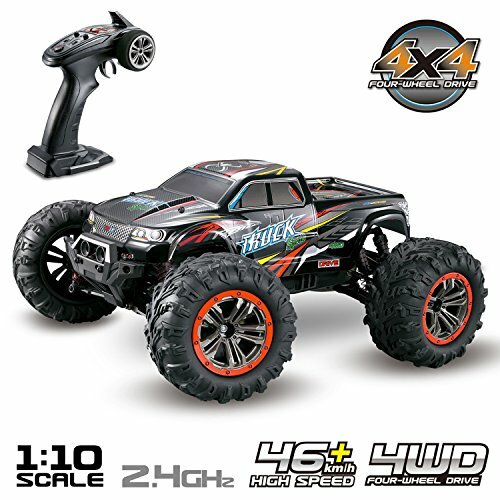 This RC truck can reach remarkably fast speeds of up to 42 km/h which can be a lot of fun. The larger tires that prevent skidding and waterproof structure also provide you with freedom to use it during wetter conditions too. 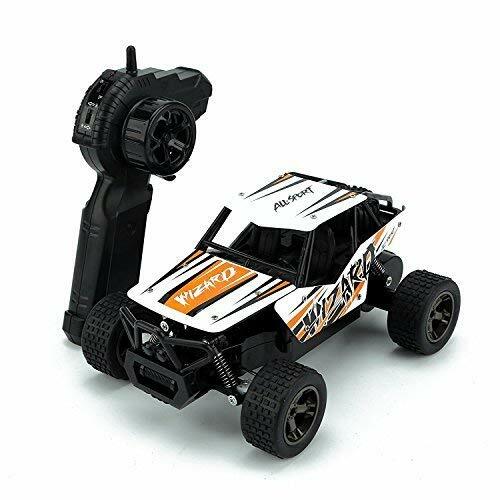 Lazaga’s RC Car can be used on all kinds of terrains, which includes tiles, carpet, road, grass, mud, and more. The powerful 380 motor inside has been designed with a protection system that prevents it from overheating. As a result, you’re able to get more longevity out of the truck. With S-truck suspension technology, you can be sure to use this on a wide range of surfaces while having complete control. This technology keeps the truck more stable and provides you with more control. We liked how powerful the motor inside this RC truck is. It allows you to reach higher speeds and have a lot of fun. However, you can also be sure that it will last you for a long time due to the motor overheat protection system. 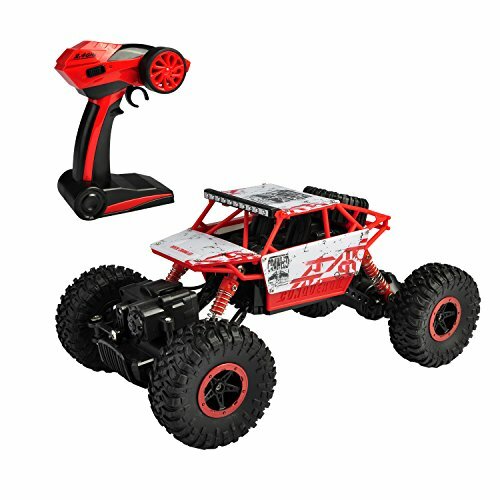 This SZJJX RC Off-Road Truck features a 4-wheel drive system which provides you with a lot of control. It also means that this truck is awesome if you’re looking to have some off-road fun. We were impressed with how they’ve included LED lights as they give kids some visual stimulation while playing with their truck. Another aspect that took us by surprise was how this RC truck is able to climb up slopes of up to 45-degrees! When it comes to off-roading, it’s likely you’ll encounter some steep inclines which you can try to climb. You’re also able to reach a top speed of 20km/h while being able to stand up to 60 meters away from the truck. The independent shockproof system and tires help to keep the truck stable which makes it easier to control. Kids have been loving how they can take this it outdoors and test it to see how far it can climb up steep slopes. AHAHOO’s truck features a 4-wheel drive system which makes it perfect for off-roading. It can be used on all kinds of surfaces, including tiles, carpet, mud, grass, road, and more. Kids have been liking how it has LED lights as it makes racing the truck around feel more fun. It’s also engaging for their visual senses. We were impressed with the speed of this truck too. It can reach speeds of up to 50km/h! This is plenty to play with all the speed you need to have a ton of fun. Not to mention, you can even take this truck out for drifting. This is a result of the rubber tires that have an anti-skid feature. There’s also a shockproof mechanism with helical spring that provides each one of the wheels with more stability. It prevents the truck from any internal damage while going over bumpy terrain. 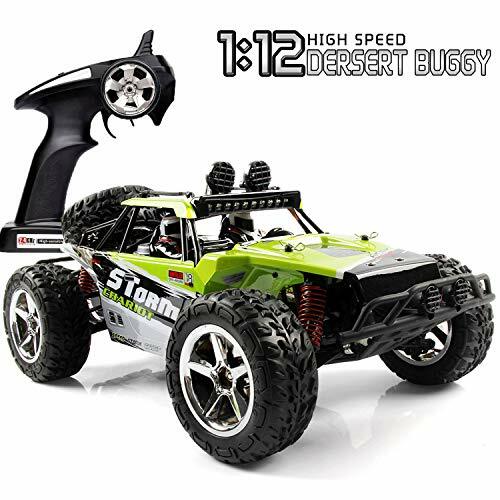 The incredible top speed of 50 km/h and the ability to drift makes this toy a fantastic option to take off-roading. With the suspension system and 4-wheel drive, you have total control! This is another AHAHOO Truck that has a 4-wheel drive feature. It’s awesome for being used across a wide range of surfaces both indoors and outdoors. We liked how this one enables you to take it up steep slopes that are up to 45-degrees. 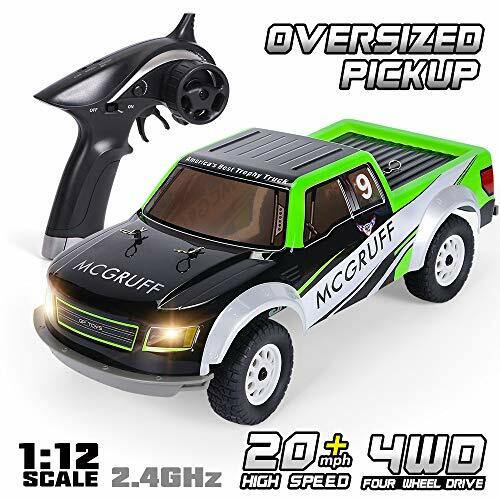 When taking an remote control truck off-road, you’ll probably come across some slopes – and this truck lets you have a lot of fun with them. It can reach a maximum speed of 25 km/h and it features tires that have been made with high-quality rubber materials. We liked how you can be standing up to 60 meters away from the truck while using the remote to control it. Furthermore, you get a fantastic response rate due to the anti-interference system that’s been built-in. Users have been having a lot of fun taking this truck up some steep slopes. The responsiveness of the control and 4-wheel drive make it super exciting to use off-road. Distianert’s Rock Crawler Truck has been fitted with a powerful brushless 390 motor. This allows you to take the truck to an incredible top speed of 40 km/h. To ensure you have complete control over this kind of speed, they’ve designed the remote control with a pistol grip. This provides you with more control over steering the truck while going at high speeds. The trigger for accelerating and decelerating is incredibly responsive which makes this truck awesome for racing. Not to mention, the steering wheel provides you with a ton of precision over how you take corners. All of this can be experienced while being up to 250 feet away from the truck. The rubber tires are heavy duty and provide the truck with a lot of stability for off-roading. Moreover, there’s a suspension system which helps to minimize any shock from rough terrain. We liked how they’ve created the remote control with a pistol grip as it provides you with precise control over the direction and speed of the truck. This is especially handy when you’re playing with a truck like this that can reach speeds of up to 40km/h! GPTOYS RC Truck has been designed with a fantastic camouflage shell. This gives the truck a unique look which users have been drawn to. It has been fitted with a very powerful motor which enables you to take the truck to a maximum speed of up to 41km/h. So, if you were looking for something fast, this truck may interest you. Not to mention, it’s great for being used on all kinds of surfaces. They’ve fitted the truck with a high-grade suspension system which ensures that each one of the wheels has its own shockproof feature. This is effective at minimizing any shock from bumpy terrain to provide you with a smoother experience. You can also be assured that this truck is safe for kids to use. This is because the plastic materials used to construct it are free from toxins. Customers have been liking the camouflaged design and how they’re able to take this truck off-roads and up to speeds of 41km/h. Hapinic’s vehicle toy has been made using plastic materials that are completely free from toxins. Therefore, it’s safe for your kids to play with. Parents have also been pleased to find that it comes with rechargeable batteries. It takes just one hour to charge and you’re able to get an incredible 30 minutes of play. This is a great option for kids who are around 6 years old because the truck can reach a top speed of 15km/h. Therefore, it’s still fast enough to be fun, but not too fast to where they can’t control it. You can also be standing up to 100 meters away from the truck and still have responsive control over it. 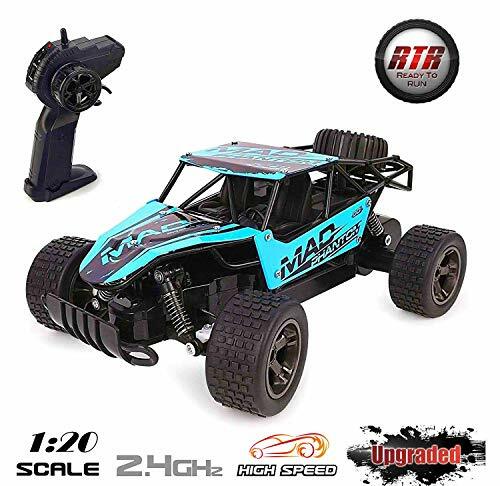 Not to mention, the RC truck can be used on gravel, sand, grass, and more. We liked how the top speed of 15km/h makes it fast enough for kids to have a lot of fun with. The remote control is also very responsive and easy to use. This Off-Roading Truck by Hosim is able to reach impressive speeds of up to 36km/h. You’re given complete control over this speed with the remote control while being able to stand up to 262 feet away from the truck. The radio system for the remote included a 2.4Ghz feature which makes the responsiveness of the control excellent. This responsiveness combined with the 4-wheel drive feature makes for an incredibly smooth experience. It also means you can use the truck on a variety of terrain. There’s suspension at the rear and front of the car which makes it effective at handling bumpy surfaces. Being able to reach speeds of 36km/h while off-roading can be a ton of fun. This is especially the case with this truck because of how responsive the controls are and how smooth the ride feels. 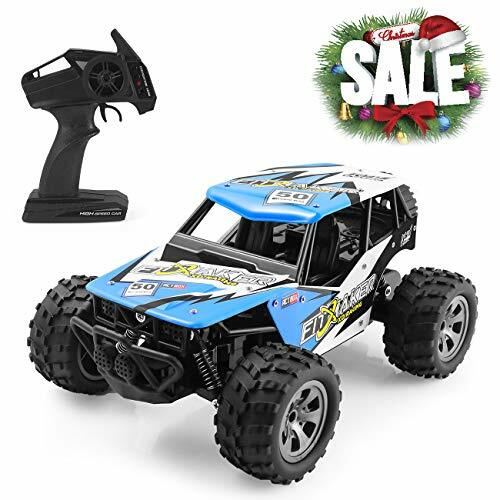 If you’re looking for a remote control electric car that you can use to do stunts with, this one may take your fancy. It can be used regularly in an upright position, or at a 360-degree rotating position. As a result, you’re given the freedom to perform some cool stunts. We liked how there are blue and red lights on either side of the truck. They have a flashing feature which makes the truck visually stimulating and more fun for kids to play with. You can use the truck for 30 minutes before it runs out of batteries. This is plenty of time to have a lot of fun with the truck. The remote lets you control the truck while being able to stand up to 50 meters away from it. The tires have an anti-skid feature which makes it great for use on wet surfaces. Users have nothing bad to say about this one! The 360-degree rotating feature is something that kids can have a lot of fun with. It’s a unique element that makes playing with this even more fun. 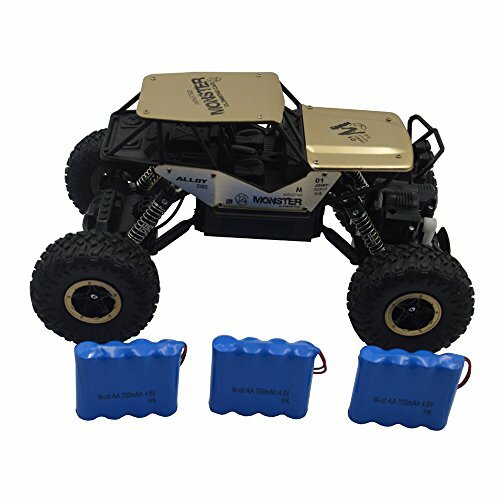 Distianert’s Electric Off-Road RC Truck is equipped with semi-pneumatic tires that are designed for off-road use. They ensure that you have plenty of torque to make navigating your way through tricky terrain easier. You can be standing up to 100 meters away from the truck and still have complete control over it as a result of the 2.4Ghz transmitter in the remote. It’s also super responsive and cuts out any interference. A suspension system has been fitted to all the wheels to make sure the truck can withstand bumpy surfaces for a smoother ride. You’re able to reach a top speed of 30km/h, which is more than enough for kids to have fun with. Parents have been appreciating how the battery can be easily recharged with a USB cable too! The semi-pneumatic tires mean that you have a lot of torque which helps you to handle tricky terrain with ease. Blomiky’s truck can be used both indoors and outdoors and is able to reach top speeds of up to 25km/h. It has been designed with TPR tires made out of rubber which ensures you’re able to use the truck across the different surfaces with plenty of smoothness. They’ve fitted a suspension shockproof system at the front and back of the truck to ensure it’s able to effectively deal with off-road terrain without sustaining damage. The remote control has a 2.4Ghz radio function which makes it incredibly responsive. It also works to reduce any interference while letting you be up to 100 meters away from the truck. The rubber TPR tires, 25km/h top speed, and responsive control make this super fun to use both indoors and outdoors. Bestoying’s Monster Truck kit has a 4-wheel feature which has been combined with a bouncy spring system. This provides the truck with a remarkable amount of support when going across bumpy surfaces. It’s also effective at minimizing the wiring on the inside being damaged from off-roading. You can be standing up to 50 meters away from the truck while having complete control over the truck. This is a result of the 2.4Ghz radio which blocks out interference and improves responsiveness. The truck is able to reach a top speed of 20km/h which is plenty for kids to have a blast with. In addition to its speed, there are strong wheels which have been designed to withstand any rough terrain to ensure a smoother experience. The heavy-duty tires, suspension, and 4-wheel drive ensure that you can take this truck to its top speed of 20km/h in off-road conditions and have a smooth experience. 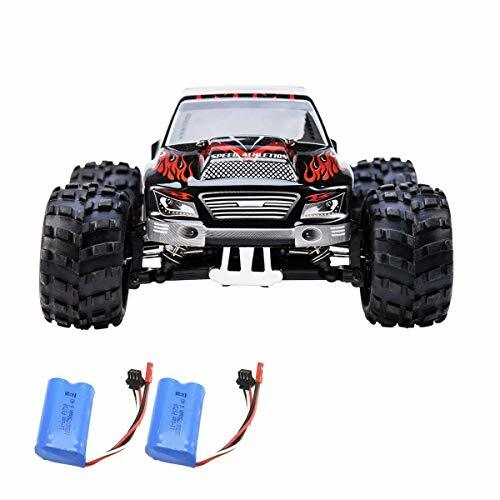 The Hapinic Off-Road RC Monster Truck has a rechargeable battery which enables you to use it for up to 30 minutes continuously when it has been fully charged. This is a lot of time for kids to have fun with, especially when you consider that it only takes 1 hour to fully charge. It has been created with 2.4Ghz radio tech which prevents any interference and increases the responsiveness. You’re able to reach top speeds of 15km/h while being up to 100 meters away from the truck. We liked how it can be used on various off-road surfaces, such as sand, concrete, and grass. We were impressed with how you can get 30 minutes of play from just 1 hour of charging with this truck. Furthermore, the controls are incredibly responsive and prevent any interference for a better experience. 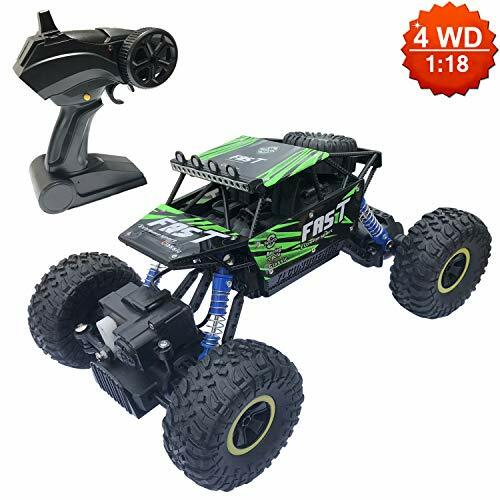 With a 4-wheel drive feature, you’re able to use this RC truck in off-road conditions and push it to its full potential. In addition to this, it’s been created with a double motor that provides you with a lot of power that enables you to reach speeds of up to 24km/h. We found this to be a perfect speed for kids who are between 6 and 10-years-old. We were impressed with how it comes with a wall-climbing feature too. It lets you climb up steep inclines of up to 45-degrees which can be a ton of fun. You’re always given complete control over the truck as a result of the 2.4Ghz technology built-in to the controller. It blocks out any interference to ensure you have responsive control over the truck. 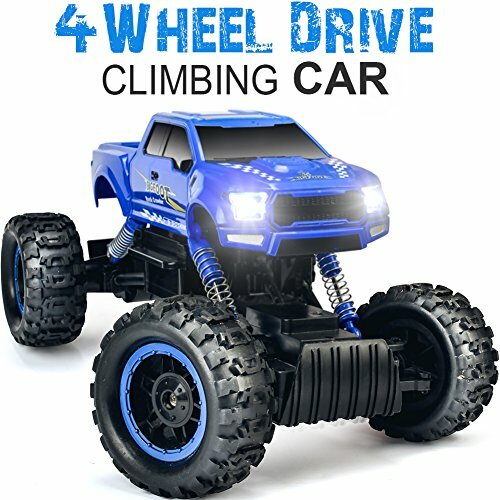 The rock-climbing feature with the truck is a lot of fun and adds a unique element that kids can experiment and explore more with. This monster truck by GPTOYS features 2 headlights which kids have been loving. It’s visually stimulating and makes the truck more fun to play with. They’ve fitted an electric brushed 390 motors in this truck which makes it a lot of fun to use. As a result, it’s able to reach a top speed of 30km/h, which is plenty for kids to have a blast with. The tires are durable and ensure that you’re able to ride across bumpy surfaces with smoothness and control. An S-truck suspension system has been fitted which makes controlling the truck even easier for kids. Not to mention, the independent springs on each tire allows for an even smoother experience. We also liked how it has an IPX5 waterproof rating as it means you can use it in wet conditions without worrying about causing damage. 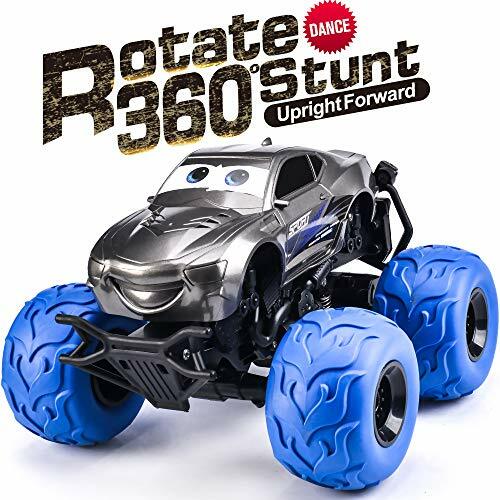 The S-truck suspension, springs, and 30km/h top speed enables kids to take this truck off-road at high speeds without worrying about causing any damage. This toy has a remote that’s great for both right and left-handed people. The knob for controlling the truck can be moved to the right or left side depending on what hand you prefer to use. It has a 4-wheel drive feature and suspension shockproof mechanism. This is an awesome combination for taking the truck off-roading and having a smooth experience with total control. We liked how you can use this truck on a variety of different terrains. this includes rock roads, sand, grass, mud, concrete, and more. We were impressed with how the control knob can be moved to the left or right side. It caters well to all users to provide them with complete control, regardless of what hand they prefer to use. This truck is able to reach high speeds of up to 40km/h. This is incredibly fast and ensures that you’ll have a ton of fun zipping it around off-road. It has a 4-wheel feature which means you have more control over the truck in rough terrain. There’s also a lot of torque available which means you have more precise control over the exact direction and speed that you want to take the truck in. The front wheels have been designed with a shock absorbing mechanism which helps to keep the truck steady for smooth riding on bumpy surfaces. This truck lets you speed around on off-road conditions at speeds of up to 40km/h while still having total control. This is largely due to how well the shock absorbers and 4-wheel drive features work. This toy from TOYEN has been designed with a 4-wheel drive feature for more control over trickier surfaces. Furthermore, they’ve included a suspension spring system which provides the truck with more flexibility to go across rough terrain smoother. Users have been liking how the torque on this is high which enables them to make tight corners more precisely. The remote has a 2.4Ghz feature which minimizes any interference and ensures that you have total control over the truck. With a top speed of 35km/h, you can be sure to have a blast with this truck on off-road conditions. We liked how this truck has a higher torque as it enables you to make more difficult moves and pull them off with confidence. This off road monster truck comes with an awesome suspension system and shock absorbers. This makes going across rough terrain feel smoother. Not to mention, the 4-wheel drive makes controlling the truck on off-road surfaces easier too. You can be standing up to 50 meters away from the truck and still have complete control over it. The maximum speed of 20km/h is plenty for kids who are around 8 years old. It’s fast enough for them to have a lot of fun while not being overwhelming and hard to control. Taking this truck out on rocky surfaces is a lot of fun and easy for kids to get to grips with. This is a result of the shock absorbers, suspension, and 4-wheel drive features. 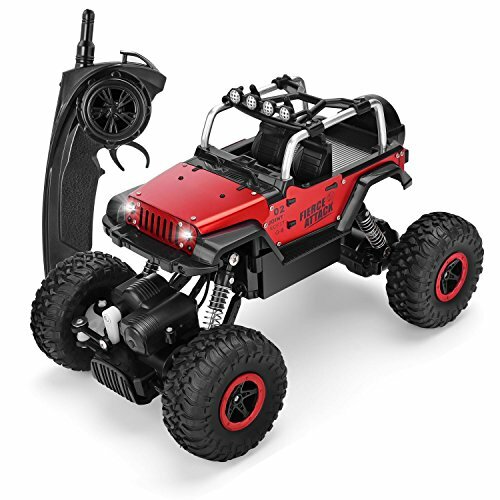 This Team Redcat remote control monster truck has been designed with a 4-wheel drive function. This makes it a fantastic option to take off-roading as it provides you with plenty of control. We liked how the remote control implements a 2.4Ghz radio as it blocks out any interference for a responsive experience. Furthermore, the receiver on the controller is waterproof. 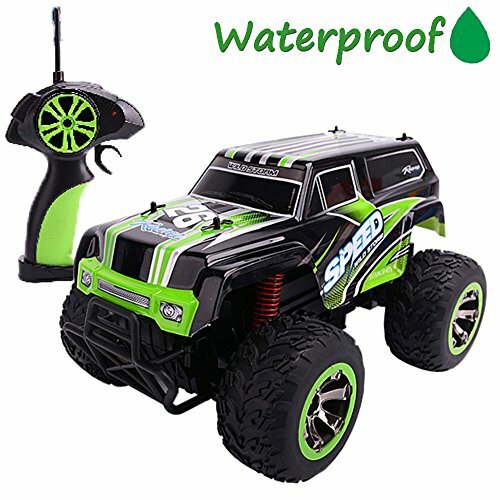 Therefore, you can play with this truck in wet conditions without worrying about damage from the rain. If you were after something that lets you have responsive control, even in the rain, the waterproof receiver on the remote of this one would suit you well. This STOTOY Monster Truck has a maximum speed of 20km/h, which is plenty for children who are around 8 years old. The 4-wheel drive means they have more control over the truck when going over bumpy surfaces. We were impressed with how the suspension system includes 4 coil springs which work individually for each of the four wheels. It ensures the truck has a lot of stability while going at its top speed. The controls are super responsive and include 2.4Ghz radio technology. This reduces the chances of interference for a better experience. The individual coil spring suspension for each of the four tires is a fantastic feature that ensures the truck is able to withstand rough terrain. Now that you know more about what some of the best monster trucks have to offer, you may be wondering a little more about what how to go about choosing the right one for your child. Simply have a quick read through our buyers guide section below to learn more about why RC and robot toys are great for you childs developemt! There is a variety of factor to consider before you go ahead and choose a monster truck toy for your child. Let’s take a look at what some of these factors are. 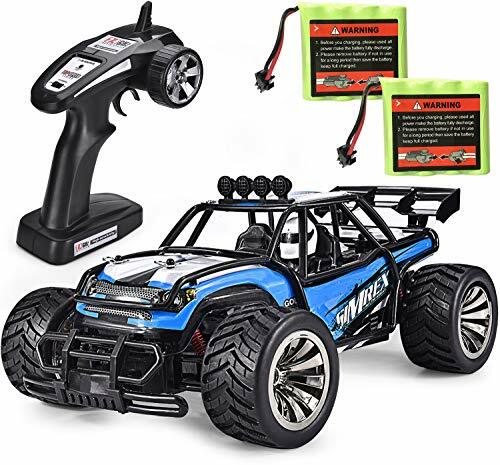 Using a remote control to drive around a small monster truck, car or animal means that your child is able to develop their coordination and motor skills. They’re keeping their eyes focused on the truck while using their hands to control its movements and speed. 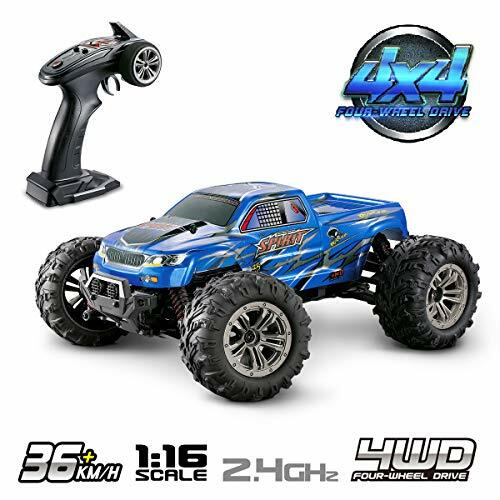 RC truck racing is an incredibly stimulating experience that is effective at helping children learn how to make the connections between their brain and actions become more seamless. Since you’re often standing a distance away from the truck while controlling it with the remote, it causes you to recruit your spatial awareness skills. When kids are accelerating, decelerating, and moving around, they’re having to be well aware of their space around their truck to avoid crashing it. Having multiple trucks to race around together can make for some very fun family time. But you really may only need one of them to spend quality time together in the beginning. You can use it as a chance to teach your child about how to use the remote and watch as they learn from you and improve. 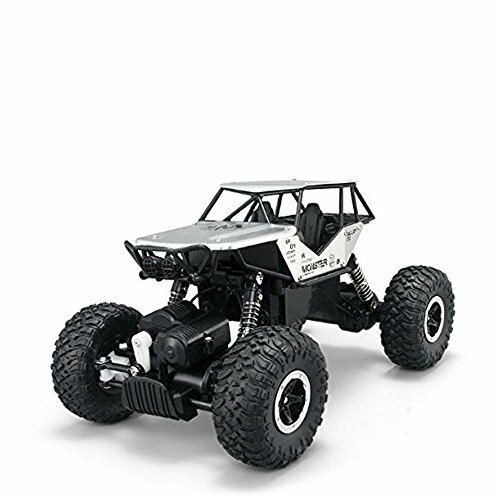 As you can see from our review, there are tons of different types of RC monster trucks available. To help you navigate your way through them easier, you’ll be interested to take a look at the section below. 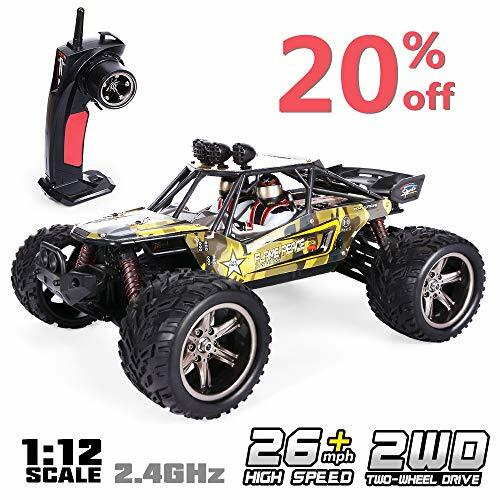 If you have a smaller space or younger child, going with a mini RC monster truck may be a better idea. They tend to be a little less powerful and more manageable for younger kids to play with. Big remote control monster trucks can be a lot of fun for kids who are around 10 years or older. They often have more powerful motors built-in and can travel at much faster speeds. 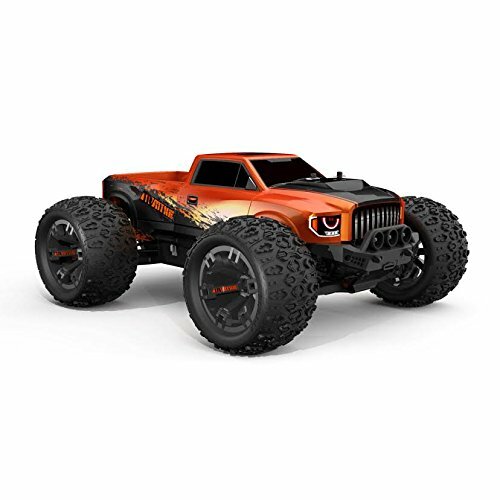 These big RC monster trucks are also great if you have a bigger and open space to play in. You’re able to control the truck from a further distance and still be able to see it easily. The RC monster trucks in our review are motorized and electrically powered. As a result, they require batteries to operate. Some of them have replaceable batteries which need to be swapped out for new ones every time they run out. This can be a bit of a hassle and become a small cost over time. 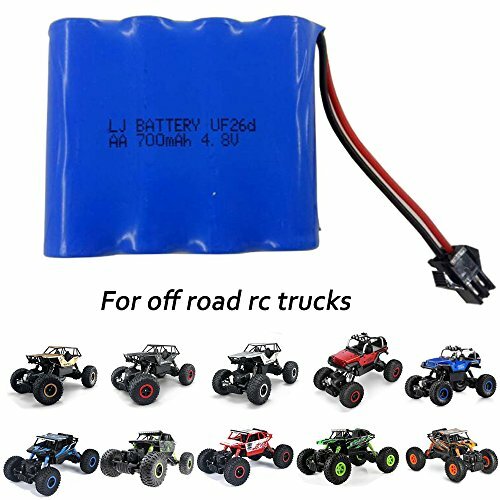 However, there are also electric RC trucks that have rechargeable batteries which simply need to be plugged in. Nitro Gas powered trucks are a little less common to electric ones but they’re actually a lot of fun since the Nitro power makes them super fast. They come with fuel bottles which need to be filled up to power the truck. Some nitro-powered RC monster trucks come with a pull-start system which younger kids would need help with. 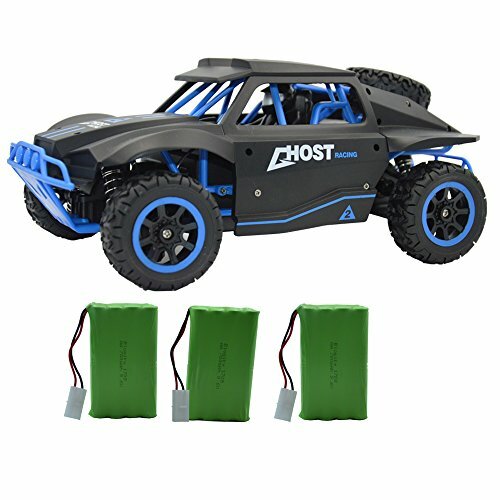 Most people prefer to play with rechargeable remote control monster trucks simply due to how convenient they are. You simply plug it in and leave it to charge, and it’s as easy as that. Depending on the monster truck you pick, these charging times could vary a lot. Some may take 2-3 hours to fully charger, whereas others may take just an hour. On the surface, faster monster trucks seem like the most obvious fun choice. However, that all comes down to who’s going to be using it. Younger children have a harder time grasping full control of the truck as the speed is too much for them to handle. However, older kids, who are around 12 years or older, may have more fun with the fastest monster trucks. Many of the RC trucks in our review are equipped with a 4×4 wheel feature. This is because most of them perform incredibly well off-road, which the 4-wheel drive helps with. This feature provides you with more precise control over the truck when going over bumpy terrain. If you have a little girl, they may be more interested in a pink colored one. Many monster trucks used to be in a neutral or camouflaged color, but nowadays, manufacturers are making them more appealing for girls to play with by using pink designs and other colors that girls love. 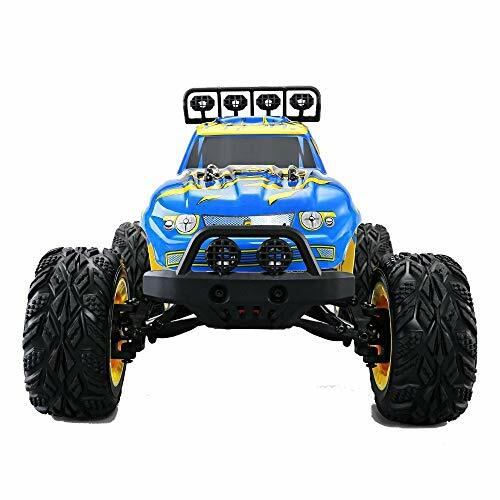 Hopefully, we’ve provided you with all the information that you need to feel more confident about choosing the best RC monster truck for your child. There are tons of options available online, but we’ve narrowed it down to the 34 best options. All you need to do is have a read through until you find the one that suits your child the best.